See also my article on tuning keys and my tuning pins for sale. The tuning pins of the old Gaelic harps are beautifully crafted art objects in their own right, all handmade to the highest standards and constituting perhaps the most time consuming and expensive part of an instrument. I am dividing the old Gaelic harp tuning pins into three different types, which we can describe as medieval, 17th century and 18th century. 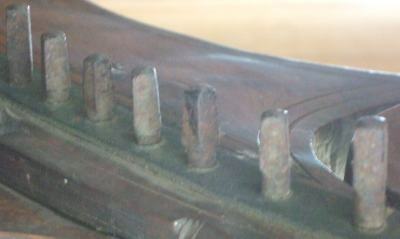 The brass tuning pins on the Queen Mary and Trinity College harp are likely medieval in date. They are simple in outline and profile, but have incised grooves running around the drives and incised cross-hatching in the ends. 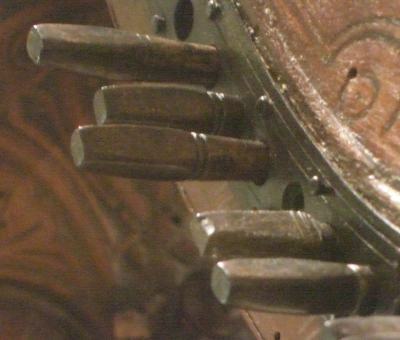 The Queen Mary pin drives are rectangular cross-section, while the Trinity pins are square. This photo of one of my modern medieval-style tuning pins shows the wear and polish from the wood of the neck, and from the brass cheek bands of the harp, as well as the rectangular end and the incised lines on the drive and also an incised marking on the shaft. The brass tuning pins on many of the old Gaelic harps are of the type I am calling 17th century. The square-sectioned tapered drive end is fatter and more boldly shaped, and has longitudinal incisions which make the end look quatrefoil rather than square. The quatrefoil end is usually also incised or cut to form a cross or a lozenge shape or both combined. The Ballinderry metalwork has feathering designs on the sides of the drives. The Cloyne fragments have pins with worn but bold lozenge-cross-quatrefoil ends. The Downhill harp has lozenges in the treble and crosses in the bass. 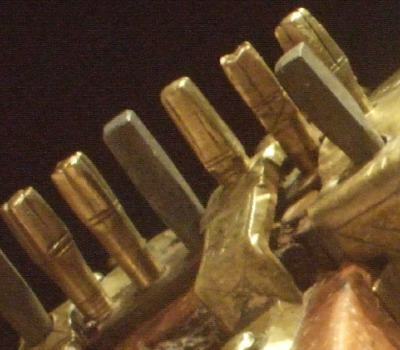 A number of the old instruments including the Offogarty harp, the Malahide harps, the Sirr harp and the O'Neill harp have cruder plain pins of iron or brass. These are nowhere near as beautiful or as sculptured as the 17th century style pins described above and must represent a degeneration of the Gaelic harp making traditions through the 18th century. There are a number of loose tuning pins from archaeological sites as well as many lying unprovenanced in museum collections. Some of these are beautiful and well made objects closely comparable to the pins in the extant harps, but others are strangely small and poorly made. There is a continuum from the beautiful 17th century pins from Montgomery Castle through to the tiny stubby bone pins from Oxford and Whitby, and it is at present not clear how these relate to the early Gaelic harp traditions and other instrument traditions including gothic harps, fiddles and lyres. Keith Sanger has started an analysis of the museum pins which is available online. Thanks to Karen Loomis for discussing these pins with me, and to Amanda Munday for drawing my attention to the Montgomery pins. R.B. Armstrong, The Irish and Highland Harps, David Douglas, 1904 includes measurements and sketches of many of the tuning pins. Joan Rimmer, ‘The morphology of the Irish harp’ Galpin Society Journal no. 17, 1964 includes photos of pins from the Ballinderry, Kildare & Dalway harps. G Ewart & J Triscott, ‘Archaeological excavations at Castle Sween, Knapdale, Argyll & Bute, 1989-90’ Proc Soc Antiq Scot 126, 1996 includes a small plain medieval-style pin. J.K. Knight, ‘Excavations at Montgomery Castle’, Archaeologia Cambrensis: Part I in vol CXLI (1992), part II in vol CXLII (1993) and part III in vol CXLIII (1994). Drawing and description of one of the tuning pins and a commentary by Graeme Lawson. First published as part of the tuning key page, April 2009. Moved here April 2012, last updated May 2012.